When and where did hydroseeding start? Hydroseeding is known as one of the most innovative techniques used for grass plantation. It has gained so much recognition that it is gradually replacing the traditional methods of hand seeding, sod application, etc. Today hydroseeding method is being used for residential lawns, commercial areas, sports grounds, parks, slopes and hilly regions. This grass planting technique was introduced first in the United States in the 1950s after the invention of the commercial hydroseeder. This machine could quickly spray fertilizers and seeds in larger areas. In the 1960s it made its way in the United States and then gradually spread to different parts of the world. Over the years due to technological advancement, this seed plantation technique has become more effective. 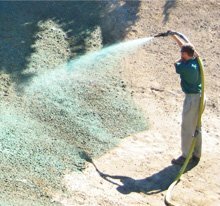 What is the hydroseeding process? Today hydroseeding in Bellevue has gained popularity as it provides faster and better results. It is also more cost-effective than the traditional ones and works great in controlling soil erosion. This grass plantation method starts with the preparation of the soil. The soil is first tested in order to determine what nutrients it may be lacking. After this is done, the existing vegetation and debris are removed from the soil while fertilizer is then added to it. The soil is tilled at least 2 inches deep, and topsoil is then added. A lawn roller is used to compact and level it. On this well-prepared soil, a mixture is sprayed from the hydromulcher covering it completely with a green coating. This mixture contains fertilizer, mulch material, seeds, and water. Once the slurry is sprayed on to the lawn, it would require regular watering till the grass blades grow. Adequate moisture and the mulch material help in the germination of the seeds. The mulch retains the moisture within the soil and also holds the seeds in place. It acts as a nutrient for the seeds and thus helps in their growth. The mulch also helps in controlling soil erosion due to wind and rain. It takes 7-10 days for the grass to come out and within a month the whole area is covered with lush green, healthy grass. However, the lawn will require proper care after it has been hydroseeded to ensure improved growth your lawn. This entails enough watering, mowing, and fertilizing on a regular basis. Though the process is less complicated, it is always better to hire professionals. Many hydroseeders use customized seeds as per the soil and weather conditions in your area. Contact us today and find out how Country Green can you help you hydroseed your lawn.